After learning about the benefits of a steel building for your next project, the next step is to choose the correct design for your needs. The DIY kits for prefabricated steel buildings predominantly come in one of two designs, which can then be split into subcategories. Below, we’ll highlight those designs and their features so you can correctly choose the design that is right for you. Quonset huts are known for being all-purpose, lightweight structures that can be easily transported and assembled without the need for skilled laborers. The arched (or half dome shape) design allows for strength and sturdiness, able to withstand windy and seismic conditions, as well as being relatively cheap compared to other styles of steel buildings. 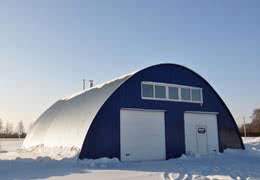 A properly erected and cared for Quonset hut can last several decades with only basic maintenance. 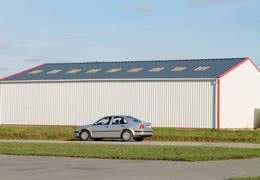 For an overview of Quonset buildings see here, and for pricing examples see here. For the most part, the main advantage the more traditional Rigid Frame structures have over Quonset huts is simply being more aesthetically pleasing. 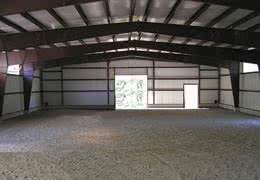 Rigid Frame prefabricated steel buildings are sturdy, dependable and cheaper than most other options. Like Quonset huts, the design you choose will be dictated by what you require the building for. These offer exceptional design flexibility, particularly where longer spans are required. 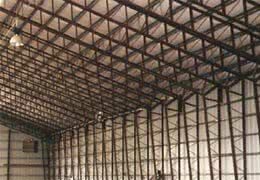 These light-weight, incredibly strong framing systems are ideally suited for situations requiring clear unobstructed floor space such as aircraft hangars and indoor stadiums. With large clear spans, open-web truss systems offer design versatility that is rare in the industry. These use tapered columns and rafters combined with bypass girts to give optimum unobstructed span capabilities. The column-free interior space is ideal for buildings such as auditoriums, gymnasiums, and aircraft hangars. These have many of the same features of clear-span frames, but by adding interior columns, the frame will span even greater widths. This economical design is particularly practical for office, warehouse, industrial, and commercial uses where rows of interior columns would not pose a hindrance. This is an economical way to increase the width of new or existing buildings without the need of a valley gutter. Lean-tos can be integrated with virtually any other type of framing system. As the technology for steel buildings evolves, both in design and in production, the terms used to describe them have changed with it. Is it a structural steel building, a modular building, a prefabricated building, a pre-engineered building, or a metal building system? All these names appropriately fit under the umbrella ‘metal buildings,’ and each one is describing a different predesigned, partially assembled structure that serve considerably different purposes. Modular Building: Three-dimensional building segments, produced in a manufacturing facility, that can be delivered to your site in different forms. One form is as complete modular ‘building blocks,’ bolted together on site, while the others are semi-finished modules, fixed together after delivery on site. Prefabricated Buildings: Sometimes referred to as prefab buildings, these structures are manufactured and assembled at the manufacturing facility. 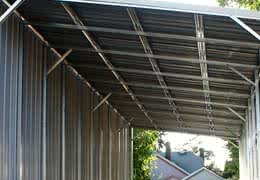 While early metal buildings (1850’s1960’s) were aptly referred to as prefabricated buildings, the modern version of a prefab building is referred to as Metal Building Systems. The modern prefab buildings are factory finished, like toll booths, guard houses, and stand-alone classrooms. Pre-Engineered Buildings: These buildings got their start in the 1960’s. Labeled as ‘pre-engineered’ due to the fact they were produced from standard designs, with limited configurations, at the factory facility. 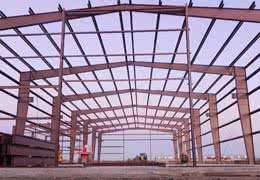 Customers were able to choose from steel buildings with standard dimensions like 30×40, 30×50, 40×60, 40×80, 60×100 etcetera. Pre-Engineered Buildings also came with framed openings with standard dimensions, used for loading bays, doors, windows and more. Metal Building Systems: The modern-day buildings, used today as small residential garages, large distribution centers with low pitch roofs, wall or roof panels and even exterior finishes like fascia’s and mansards. The term Metal Building Systems began in recent years by the industry to accurately describe the structural engineering concepts and buildings used in the industry today.